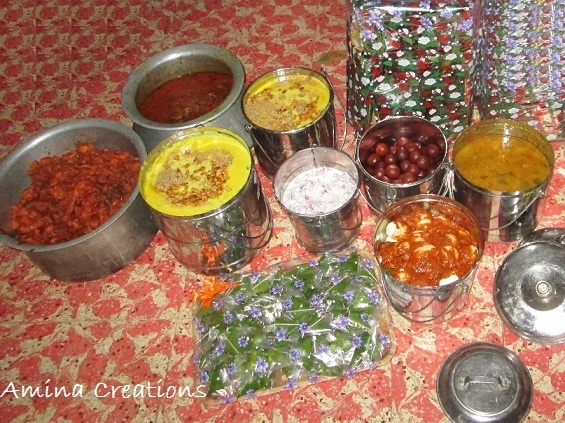 A Dawaat is a special feast organised during weddings, festivals, social gatherings and special occasions. And a Daawat in Ambur is incomplete without the quintessential Ambur Mutton biryani. Most people would be well aware of Ambur Biryani and its fabulous taste. Coming from Ambur located in the North Arcot district of Tamil Nadu, an industrial town popular for its leather industry, Ambur Biryani has gained a lot of popularity in the Southern India. In this post I would be sharing common dishes that are often laid and are a must have during an Ambur daawat. The real recipe behind the taste of Ambur Biryani is still a secret. The special taste comes when special long grain basmati rice is cooked with a host of spices and a correct blend of masalas along with Mutton over firewood. 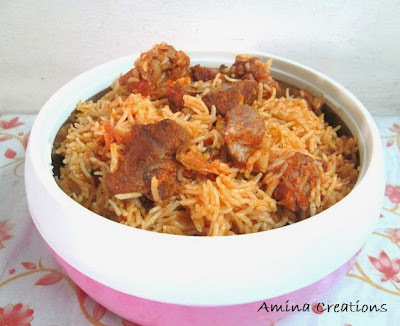 My mother's recipe of Mutton Biryani surely comes close to the real Ambur Mutton Biryani. You can have a look at the recipe and I am sure you will like it very much. This is a main side dish which is often served here during weddings. It is simply spicy and delicious. 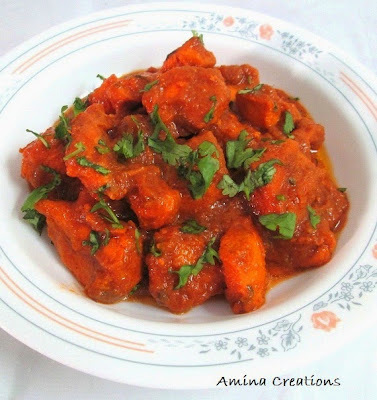 The recipe to make this authentic chicken masala gravy can be found here. This is another side dish that is quintessential with Ambur Mutton Biryani. 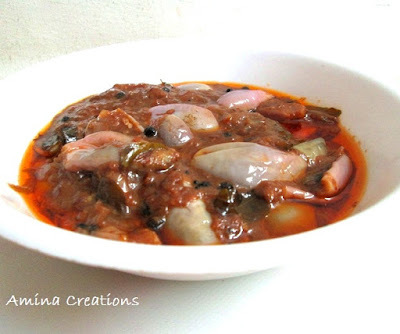 The brinjals are fried and cooked in tamarind gravy. The recipe can be found here. Muthanjan is a must have sweet during all occasions. It is a rich sweet made using milk, condensed milk, saffron and dry fruits. Check out this page for its recipe. Jamuns are another must have sweet during all feasts. They are usually prepared using khoya but we can also prepare it using ready to eat mixes. The recipe can be found here. Onion raita is basically curd mixed with sliced onions and green chillies. It is a also must have with Biryani. Beeda is a is usually eaten after completing the meal. It is made by combining betel leaf with areca nut, mukhwaas and slaked lime. Several types of Beeda are available and it is the filling in each which makes it different. Along with these basic dishes several other dishes are also popular in Ambur and are served during feasts. Some of them being Chicken fry, Chicken 65, Hara chicken, Tandoori chicken, Naan and Roomali roti, etc. Each dish has its unique flavour and taste and would delight you to the core. With this we come to the end of this culinary journey of Ambur. I hope my readers will like this post. Do share your opinions and views of the food if you have been there in the comments section. Looking forward to your comments.